Synopsis: Now at seventy-three volumes, this popular MLA series (ISSN 1059-1133) addresses a broad range of literary texts. Each volume surveys teaching aids and critical material and brings together essays that apply a variety of perspectives to teaching the text. Upper-level undergraduate and graduate students, student teachers, education specialists, and teachers in all humanities disciplines will find these volumes particularly helpful. About the Author&colon; Robert F. Gleckner is a professor of English at Duke University. He is the author of "The Piper and the Bard: A Study of William Blake," "Byron and the Ruins of Paradise," "Blake's Prelude: "Poetical Sketches"" and "Blake and Spenser,"
6. 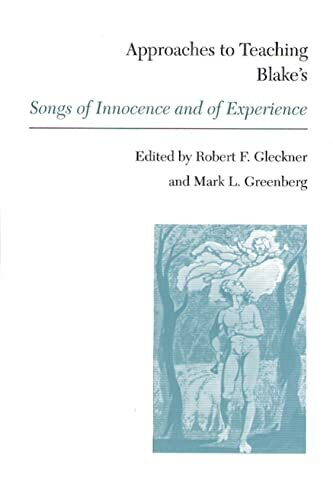 APPROACHES TO TEACHING BLAKE'S SONGS OF INNOCENCE AND OF EXPERIENCE. Gleckner, Robert F. and Mark L. Greenberg.